Sometimes it is useful to be able to assess your group and input some ideas that can help build them into a more effective and creative team. This article gives you some areas to reflect upon and consider how effective teams evolve, what makes them work together well and your role with the group in helping them. It also provides some suggestions on how groups can become more effective and some tools and methods that can help with team building. A team is a combination of people, whose coordinated input is necessary to accomplish a given task or set of tasks to get to their goal(s). They have been formed to carry out specific functions – they have objectives or goals. Their aim requires team members to work together and coordinate their activities in some way or other. A high degree of interdependence. A strong desire to work together. Key commitment from the people with “power”. Set and agree on goals, objectives and priorities for the team. Analyse and determine how each team member is to contribute towards the achievement of those goals. Examine the group’s processes or procedures in; communicating, problem solving and decision making. Examine the relationships amongst the people doing the work, and what their feelings are towards each other and towards the tasks they need to achieve. 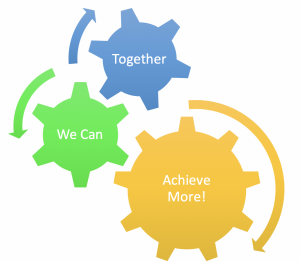 Much of what groups do is about problem solving and decision making to contribute towards achieving their goals. We measure our success in terms of outcomes, and the common temptation is to act before we really understand what the problem is. We often use the phrase “treating the symptoms rather than the cause” to describe ineffective problem solving. To support a group effectively you need to be able to help them identify any problems, determine their cause, decide on a solutions and develop a plan for action and monitoring. Is the problem related to the goal of the group? What do you need to make a decision about? Make sure that each person in the group identifies the same problem. Check out the perceptions of the group. What sources would be helpful? What will your information cost? How will your needs, values and goals influence your information search? What questions are still unanswered? Do you have enough general and specific information to form alternatives? What are the short and long term benefits of each alternative? What trade-offs are you willing to make? Why is this the best alternative? What impact and implications will your decision have on you and on others? If groups are to be successful, they need to be clear about what it is they wish to achieve and how they plan to go about it. If the steps between planning and action are not carried out well, the group can operate haphazardly and people will then become frustrated. To avoid this, a group needs to be able to identify what they want to achieve, how they want to get there and importantly the first key steps required to take effective action. An article that can help with goal setting and planning can be found here. A leader is different from a manager. For groups to cope with and implement change, both leadership and management are needed. Leadership may come from the group or it may be provided by an individual. It is important to develop an understanding of the change process and what needs to be created, so that leadership can happen during change. Managers – tend to be outcome and output focussed. They have subordinates who carry out jobs under their management. They often occupy a position which they have been selected into, within an organisation and which is part of a hierarchy. They have a formalised authority. Leaders – are focused on people, whilst still being achievement focussed. They have followers and not subordinates (unless they are also a manager). They motivate, inspire and give energy to others, who follow their lead voluntarily. If they are part of a hierarchy, they may occur at any level. They are passionate. They are not reckless with people, but do tend to be less risk adverse. Their role in the leadership of the group may not be formalised. Good teams have good rapport. Good rapport helps team members establish effective interpersonal communication. The principles of “active listening” are extremely helpful in this regard. For further information on active listening, click here. The ability and skill to really know another person, to look at the world through someone else’s eyes and get a feeling of what the other person’s world is like. The ability and skill to communicate this understanding to the other person, in a way that picks up the feelings and behaviour revealed. Try to be open and genuine, so that you are spontaneous. Be who you are and not an adopted pose. Respect the speaker at the time as a unique, self-determining and able person, who has your support and confidence. If you ask good questions and listen well, you will get sound information. Then you can make effective decisions. • Encourage the person to speak freely. • Invite discussion and expansion of early comments and thoughts. • Explore ideas and opinions. • Help focus on the topic at hand. • Call for brief, succinct and focussed responses. • Confirm or refute knowledge that you already have. • Provide feedback to verify your understanding. These questions are used to confirm the information exchanged during the interaction. These questions are used if the exchange becomes bogged down in over-analysis of the past. You might consider a switching or jump-style question such as “What would you like to see happen differently in the future?” or “What lessons can we draw from this experience?”. These questions move from a focus on the problem, to a focus on the options and enable individuals to work towards a better outcome. 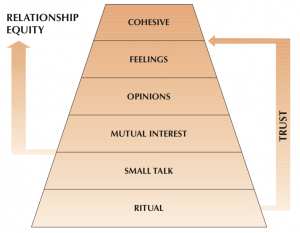 It can be useful to picture your group’s communication as a hierarchy. As groups progress and develop their relationships, they build trust and more equitable relationships, which improves their effectiveness. • Sounds (including tone) of the language. • 7% of the meaning is conveyed by the words alone. • 38% by voice tone, inflection, speed, pronunciation and emphasis. • 55% by facial expression and posture. If our body or voice convey a different message to our words, people will either be confused, lack trust in what is being conveyed, or respond to the non-verbal communication. The level at which we seek to communicate will depend on our own preferences for self disclosure and privacy, as well as our relationship with the person or people concerned. As extension professionals it can sometimes be useful to reflect on why some group members are not listening well to others. By identifying and then validating such behaviour, solutions to improve things can be suggested or implemented. We physically can’t hear well – High background noise or poor hearing. We believe listening is a function of others; we talk, they listen – People forget that two ears and one mouth can be used in that ratio. Talking relieves tension – Silence can be uncomfortable and speaking makes me feel more comfortable and relieves my tension. They share and understand their common goals, have a common focus and all are motivated to achieve them. Each team member has a degree of emotional intelligence, that is they have “social sensitivity”, they can understand and empathise with the feelings and views of others. Team members are true to their word with each other. They have a good mix of personalities, e.g. introverts and extroverts. They communicate proactively, they anticipate and are outcome focussed and recognise the need for efficient and effective interactions. They are supportive of one another. They each contribute their fair and expected contribution and recognise their position and role in the team. Each member participates well. There is a good representative of leadership present. Leadership can shift and there is not an over reliance on particular individuals. They are organised, have good group processes and are efficient. They regularly challenge things and themselves. This is appreciated as good group process and people feel safe at those times. Conflict is seen as a healthy process and people have trust and respect regardless if there is conflict. They can readily achieve consensus and a way forward. They make time for fun as well as work. Enjoyment is one of the outcomes in working together. People are comfortable and there are no obvious tensions. List the characteristics that make an effective team. Use a checklist to determine areas where your team may be experiencing problems. Encourage creative thinking in your team’s activities. Understand your own preferences when working in groups. Understand the influence of personal differences in your group. 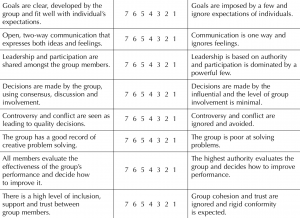 Understand and apply stages of a group development model, to optimise group effectiveness. Adopt appropriate leadership, it is needed in a situation. The use of some tools can help support team building. Typically they help with the self reflection of team members and/or the team as a whole. These tools aren’t an “exact science” but rather a guide to asking useful questions that help group members consider where they and their team is at and what could help them be more efficient and effective. They can also help to see if they have an effective mix of skills and required behaviours. This is a tool that was developed from the work of Dr Meredith Belbin. It is a way of looking at how balanced a team is and what their strengths and weaknesses are. It uses nine identified team roles that are grouped into three: Action Orientated, People Orientated and Thought Orientated. The premise is that by individuals and a team as a whole better understanding their strengths and weaknesses, they can each better contribute and the team as whole can identify ways of being more balanced and effective. This article and accompanying video by MindTools explains the opportunity in more detail, click here. Bruce Tuckman in 1965, summarised the results of over 50 studies into a four-stage model, that characterises any groups stage of development and growth. Stage I, Forming – characterised by testing and dependence. Stage II, Storming – characterised by intra team conflict. Stage III, Norming – characterised by the development of team cohesion. Stage IV, Performing – characterised by functional roles. Further information on the model can be found here. The DISC tool can be used to help individuals and teams understand themselves and each other better and in doing so improve their effectiveness. More information on DISC can be found here.